The 1992 Constitution granted human rights, equality, and a Constitutional Court that would ensure judicial independence and safeguard people's constitutional right. * It established a unicameral parliament headed by the Prime Minister and joined by a nationally elected President. The government system was decentralized as each aimag (province) formed a self-governing body, or local hural (assembly). Such agencies as the Government National Security Council, the Constitutional Tribunal, and the General Council of the Courts were established independent of government control to create checks and balances for the Parliament. Modern Mongolia is a parliamentarian democracy, meaning that the Mongolian parliament (Ih Hural - State Great Assembly) is Mongolia's main legislative body. The voters, who are Mongolian citizens of age 18 and older, elect members of Parliament every four years. The elections are held by simple majority rule, and polling is only valid if at least 50% of the voters cast their vote. The Prime Minister of Mongolia, the head of the government, presides over the Ih Hural and forms the government, i.e., selects members of the cabinet to head each ministry. The voters also elect a President who is head of state for a four-year term. 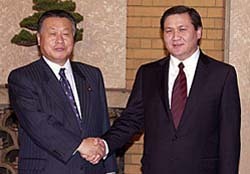 Mongolian President Natsagiin Bagabandi (right) and the First Lady of Mongolia in India. While Americans refer to all three branches (legislative, executive, judicial) as "the government," in Mongolia this term is reserved for the Prime Minister and Cabinet of Ministers. While administrative and territorial units of Mongolia are under central state government, they have a right to limited self-government. Local government bodies may issue ordinances within their powers, and have the power to make independent decisions on socio-economic matters of the respective territorial and administrative units. On the level of aimag and sum, elected assemblies make the policies. On the bag and horoo levels, general meetings of citizens make decisions (Article 39:2).